Bought this for my husband. I like it but he wasn’t crazy about it. Keep yourself fashionable and in style with this handsome leather bracelet. 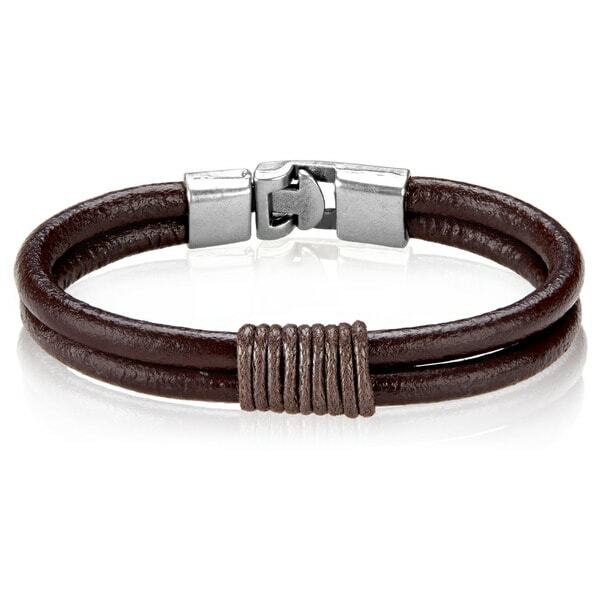 This men's jewelry item features double leather strands twined together at the center of the bracelet. A simple, yet unique design gives this item a fashionable appeal, and it is sure to get you noticed. The leather bracelet is soft and flexible, and contours well onto the shape of your wrist for a comfortable wear. This bracelet measures 8 inches long by 12mm wide by 9mm thick, weighs 13.1 grams, and secures with a anchor toggle clasp. I’ve been looking a long time for a bracelet that will fit my 11 year old tall, skinny twin grandsons. This bracelet arrived yesterday and will work just fine. The beautiful brown leather and metal clasp are good quality. The bracelet measures 8 inches from tip to tip, but when latched reduces the length to about 7 inches. I bought just one to check the sizing, but I’ll be buying another today. The delivery was quick and I’ll have time to get the second one before I leave for my Christmas trip. This was a great find!! Shopping for an inexpensive gift can be a headache. This is a very stylish men's bracelet. When this bracelet arrived in USPS, very quickly I was surprised by the quality of the bracelet. I has a unique latch so I decided to keep it for myself. It still had a leather smell. This was a very inexpensive piece of jewelry and I will probably purchase another one as a gift. The bracelet is too tight at 8 inches, even though I have other 8 inch bracelets that fit. The clasp is impossible to close by myself. I am returning the bracelet. Ordered this for my husband for Christmas. Is a nice bracelet and seems well made. Is a little hard to get on if you have a larger wrist, but like it overall! This was a present for my spouse who has a smaller frame. It is beautiful and the leather is really strong but it's a little shorter/smaller (length) than I thought it would be so it fit snug... to the point where I would recommend it for a female. Ordered this for an ankle bracelet Its strong and perfect for what I needed and wanted. Just the right size. Every one compliments me on this. Well made and a great looking bracelet. Unfortunately as others have stated it is too tight for a normal sized male wrist. I was able to stretch it to fit my wrist by soaking the bracelet in water and forcefully sliding it down a baseball bat. Let it sit overnight...fits perfectly. I like everything about this bracelet. Purchased for my 19 year old nephew. It’s manly and stylish. It’s well made. Received on time, the product was brad new. The quality looks good!